In a normal hip, the head of the femur moves smoothly within the hip socket enabling movement without pain. With femoroacetabular impingement or FAI, the femur pinches against the cartilage in the hip socket impeding smooth movement and causing pain. 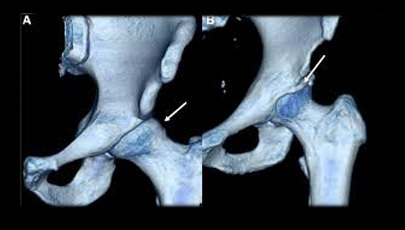 Femoroacetabular Impingement syndrome is a condition affecting the hip joint in young and middle-aged adults. Treatment options vary from conservative treatment to arthroscopic and open surgery. Many activities involving repeated hip motion increase the frequency of this abnormal contact in FAI sufferers. These include sports such as soccer, ice-skating and gymnastics. However, FAI-related pain may occur within a normal range of motion during actions not normally associated with a need for physical demand such as the motions of sitting down and standing up. The treatments for FAI vary considerably. Conservative/nonsurgical treatments should always be considered first – this can include reducing levels of physical activity and having pain medication and physiotherapy. Specifically, Physical Therapy can also help to identify specific movement patterns that may be injuring the involved hip. These types of interventions may be successful in reducing the pain and swelling in the joint. Due to the condition being diagnosed frequently in adolescents and young adults, various surgical techniques have been developed in order to preserve the hip joint, preventing the need for a total hip replacement and allowing the patient to continue with an active lifestyle. Surgery may be arthroscopic or open. Femoroacetabular impingement is cause by the femoral head and acetabulum rub against each other creating damage and pain to the hip joint. The damage can occur to the articular cartilage (the smooth white surface of the ball or socket) or the labral tissue (the lining of the edge of the socket) during normal movement of the hip. The articular cartilage or labral tissue can fray or tear after repeated friction. Over time, more cartilage and labrum is lost until eventually the femur bone and acetabulum bone impact on one other. Bone on bone friction is commonly referred to as Osteoarthritis.